The fully bloomed amorphophallus plant. The fully bloomed amorphophallus plant stands nearly 64 inches tall. Today, the Southeast Charles L. Hutson Horticulture Greenhouse got more foot traffic than usual. People filtered in throughout the day, the majority of them asking the same question: “Where’s the stinky plant?” By the time workers would point to a tall maroon shoot on the northern end of the greenhouse, visitors would be scrunching their faces and gasping for air. One direction was needed, and that was to follow your nose. 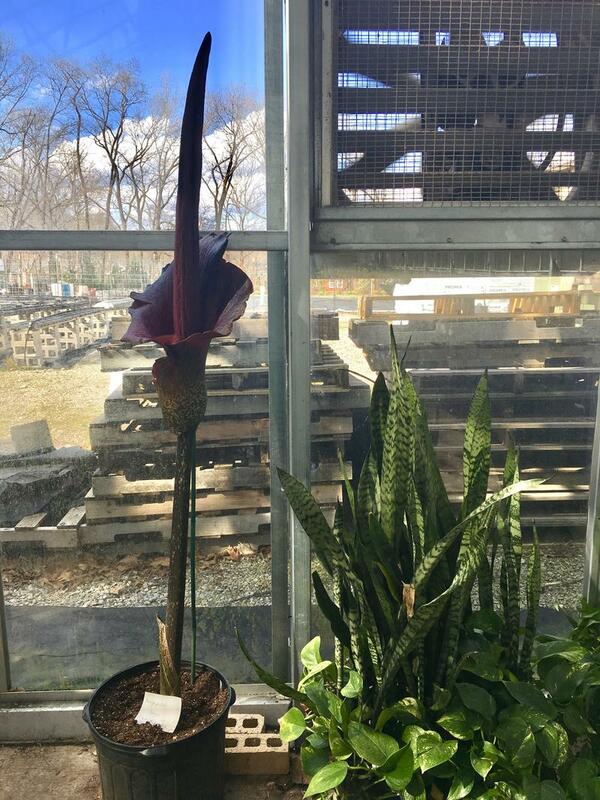 The famed konjac amorphophallus plant housed at the greenhouse started budding 2 weeks ago, but didn’t fully bloom until last night. “Stinky Jack,” as it’s been affectionately nicknamed, stands at 64 inches tall, and comes from a large family of plants originating out of the subtropical regions of Asia and Indonesia. It simply looks like a huge, maroon cow tongue surrounded by a petal of the same hue... and it reeks of roadkill. Why does it smell so bad? 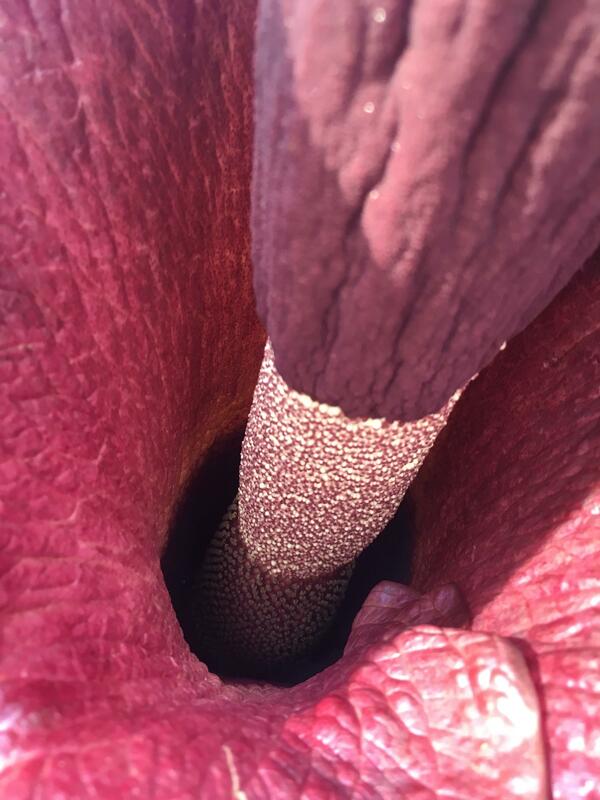 Greenhouse manager, Melissa LaPlant says amorphophallus plants put off the smell for pollinating purposes. “Like some other plants will have nectar to attract hummingbirds and butterflies, this attracts flies,” says LaPlant. Which makes sense, because what do we usually see hovering over roadkill? “It wants to attract flies for it to be able to pollinate and to create the fruit, create the seed- the whole reproductive cycle,” she says. It’s not the only one on-location, either. 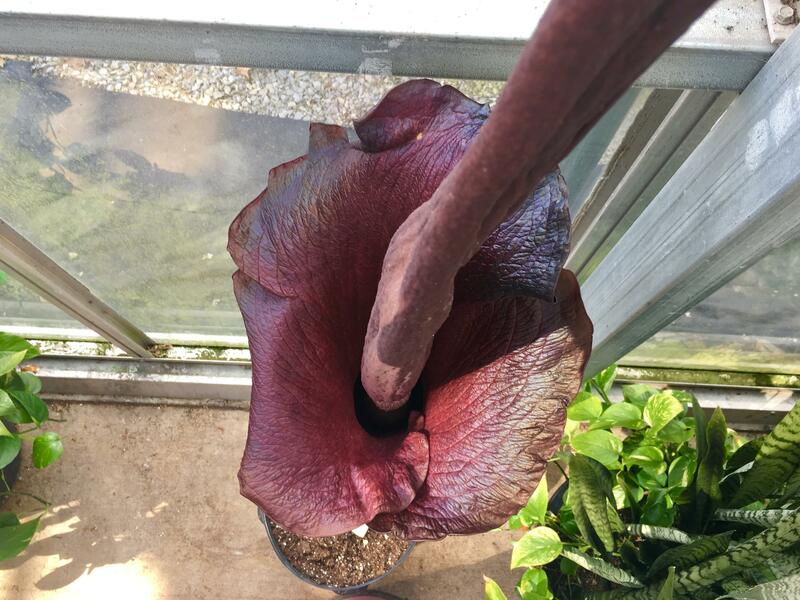 “Stinky Jack” came to the greenhouse as a donation from Ohio University to Southeast back in October, along with another 35 pounds of amorphophallus bulbs of 10 different species. LaPlant says the donation was anonymous, but the mysteriousness didn’t take away from the excitement. If you’re wondering how long you’ll be able to smell “Stinky Jack,” we have some bad news. He’s expected to die off in a few days, back to a leaf shoot that will eventually settle into dormancy. This process will start again with no estimated time frame. 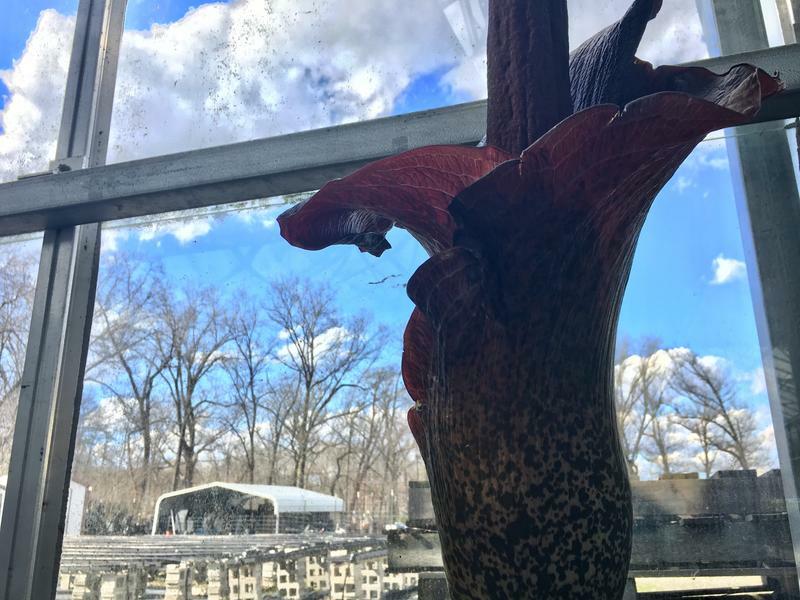 The good news is, the greenhouse has three other amorphophallus plants expected to bloom within the next two weeks. LaPlant has more ideas for these plants in the future. Southeast Missouri is in hardiness zone 6B, and the amorphophallus plants are supposedly hardy for zone 7. In a couple of years, the greenhouse will be testing how hardy the konjac species is by planting baby konjacs around their grounds in a protected area. “If they’re hardy enough here, you may actually be able to grow one in your own garden in a few years,” says LaPlant. She estimates the konjac species to be on the market for nearly $25. That is, if you can find them. If you’d like to visit and catch a whiff of “Stinky Jack,” the Charles L. Hudson Horticulture Greenhouse will be open from 9 a.m - noon tomorrow, March 31.